As a trusted real estate advisor, Josh prides himself on providing exceptional service to all of his clients. Having sold properties from Denver’s finest neighborhoods out through the foothills, this exceptional service is a direct result of his commanding knowledge of the Greater Denver market as a whole. 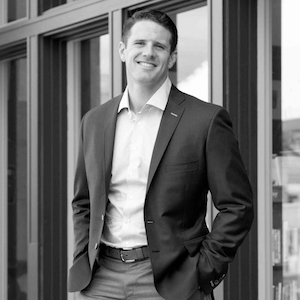 After a 7-year professional baseball career with the Montreal Expos, Texas Rangers, and Boston Red Sox, Josh transitioned into the real estate world. Working with a Palm Beach-based family office for a high net worth family, Josh was responsible for managing the family’s legacy assets – including real estate holdings spanning from Hartford, Connecticut down to Miami, Florida, and continuing to a 2700-acre ranch on the Costa Rican coast. During his tenure, Josh experienced first-hand how high net worth clientele handle their real estate. Deciding it was time to get out of South Florida to pursue his dream of living closer to the mountains, Josh took a position with a wealth management firm in Denver, where he worked for several years. As real estate has always been a passion of his, he knew it was time to make it his career. The transition was a successful one and Josh did over $10 million in sales volume in his first 12 months in the business. Josh’s clientele ranges from the sophisticated investor and bankers to athletes. Josh earned his Bachelor’s degree from Florida Atlantic University with a major in international business and trade. He lives in Denver and is an avid skier, hiker/climber, triathlete, and overall fitness enthusiast. "We have worked with Josh on many occasions over the past several years, and he has always been wonderful to work with. He is extremely knowledgeable and hard-working, and goes out of his way for his clients. We never worry when Josh is running the show, and would highly recommend him!" "Josh is the best of the best. A great agent in Denver selling both new construction and some of the most beautiful homes in Denver. Knows how to make things happen and bring deals together that meet his clients needs. ★★★★★ "Josh McKinley has been MAG Builder's listing agent for approximately 2 years. During that time, Josh has taken the time to understand our product and is diligent in making sure he understands the nuances of each project and what can and cannot be done with each one so he can best sell to the end user. Josh is in constant contact with each of us to ensure he is up to date on any changes that might have been made and educates himself on the building process so he can then talk intelligently to prospective buyers. Josh has been an integral part of MAG Builders and we are lucky to have him on our team." There is not now, nor will there ever be another residence quite like this in Denver. Towering over the city from the eastern edge of the 44th and 45th floors of the Four Seasons Private Residences building, this 6295 square foot home is the physical embodiment of form and function, of grace and elegance, while remaining at its core a modern architectural gem. Lovingly remodeled from top to bottom in 2016, this is precisely what you'd expect from the city's best urban penthouse. State of the art technologies, Bulthaup kitchen, Italian stone fireplace, and of course views of the city and surrounding mountains that you have to experience to believe. However, the true value in a place like this is time - and what it can do for you when you are in control of it. The Four Seasons staff is the best in the world at taking care of the things that get in your way, giving you back time so you can focus on the things that truly matter to you! Check out video and web site tours!